An innovative blended-learning approach aims to develop an entrepreneurial mind-set in all engineering students. 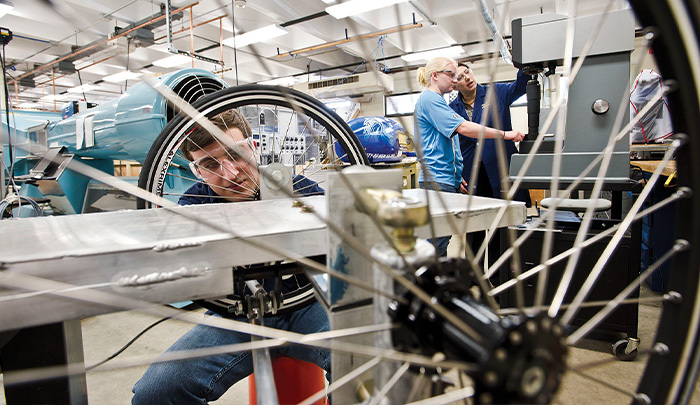 Many engineering colleges are attempting to impart entrepreneurial skills to their students. They use a variety of approaches, including having students take business-oriented courses, encouraging students to participate in extracurricular activities such as start-up or innovation competitions, and working with start-ups in business incubators. Significant constraints within most engineering programs are already-packed curricula and limited elective credits that can be applied toward courses in business or entrepreneurship. Having to take credits beyond program requirements limits the number of students taking entrepreneurship courses. Small colleges are particularly challenged by not having enough faculty with expertise in entrepreneurship. To overcome these constraints and difficulties, the University of New Haven created an ambitious model that enables all students to develop an entrepreneurial mind-set without having to take courses beyond those required for graduation. The model is transferable to other institutions and scalable to large numbers of students. We developed 18 short e-learning modules on a variety of topics related to entrepreneurial thinking and integrated them into regular courses that students take over four years of engineering and computer science programs. The modules were designed to address entrepreneurial-minded learning outcomes and complementary skills. Content experts developed each module guided by a team of reviewers within the Blackboard Learning Management System (LMS). Each consists of text, short videos, interactive exercises, quizzes, and a final comprehensive test. Students use the e-learning modules outside of class. For effective integration, instructors need to provide a contextual activity—for example, they might tailor a course project or assignment so that students apply what they learned to discipline-specific problems. Each module typically takes four to seven hours to complete, including the contextual activity, which does add more work to the curriculum. However, four to seven hours of additional work can be easily absorbed within a course spanning a semester. The additional knowledge learned and mind-set developed will give students a distinct advantage in today’s work environment. Students can learn entrepreneurial topics without taking extra courses or credits. Faculty do not need to be experts in the entrepreneurial topics. They only need to be familiar with the content and develop a contextual activity, through which students apply what they learn. The contextual activity can be aligned with the regular content of the course, and therefore students learn to apply entrepreneurial concepts to solve problems related to the course and specific to their discipline. Faculty do not need to give up class time dedicated to teaching technical topics since students learn the entrepreneurial topics outside of class. The entrepreneurial concepts delivered to students in different sections of a course are identical and not instructor dependent. Because the modules are integrated into regular courses, an entrepreneurial mind-set can be developed in every student over the duration of his or her undergraduate program. Fourteen modules have been integrated into courses within seven engineering and computer science programs at the University of New Haven, and the remaining four will be integrated over the coming year. Through a mini-grant program administered over the past three years, about 75 faculty at 54 other universities and colleges in the U.S. have deployed our modules in their courses. They were exported from Blackboard and imported into a variety of LMS’s at other institutions, including Canvas, Desire2Learn, Sakai, iLearn, and Moodle. Greater detail on the e-learning modules and their integration into engineering and computer science courses is provided in the paper entitled “Developing an Entrepreneurial Mind-set in Engineering Students Using Integrated E-Learning Modules” published in Advances in Engineering Education. The e-learning modules are available for download from https://engineeringunleashed.com/. All authors are from the University of New Haven. Ronald Harichandran is dean of the Tagliatela College of Engineering. Nadiye Erdil is an assistant professor of industrial and systems engineering. Maria-Isabel Carnasciali is chair of the department of engineering and applied science education and an associate professor of mechanical engineering. Jean Nocito-Gobel is a professor of civil and environmental engineering. Cheryl Qing Li is an associate professor of mechanical engineering.